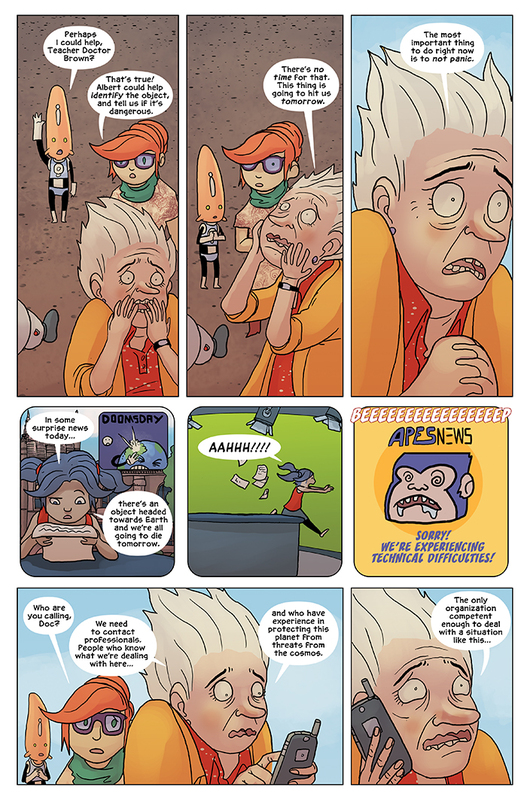 The new Albert the Alien page has the teacher freaking out on the roof of the school – and possibly freaking out the students, as well. This teacher is a little easily excitable, I think, and prone to melodrama. I did like the bit about Miranda trying to give the students a very quick update – always trying to bring the latest and greatest news to the school, that Miranda. But who could the teacher be calling to help with this situation? We’ll find out in the very next pages! It’s not too late to appear in a future story of Albert the Alien! We offer roles for teachers, parents, and students in this comic all the time on our facebook page. And if you’re an adult but want to appear as a student, Gabe can easily design you to appear as a younger version of yourself. If you’re interested, please message Gabe or myself on here for pricing.